The 418 Bus from Estoril took 30 mins to get to the pretty little mountain town of Sintra. Sintra is touristy and priced accordingly but a must do if in Lisbon, once you arrive into Sintra you can pick up double decker hop on hop off buses for around 18 Euros per Adult and 14 Euros a child, or a much cheaper 5 Euro per person on the 434 tourist bus, which is what we went with, it was also hop on hop off and took us everywhere we wanted to see, I do recommend the bus or some form of transport as everything worth seeing is quite spaced out and all up hill, with kids it’ll probably be too much to walk to each site. Every place worth visiting cost quite a lot to get into around 30 – 40 Euros for a family of four, so it’s good to know before so you can budget accordingly for one or several sites, there’s a discount ticket available if you go to multiple, but this only knocks it down by 10% (prices and discounts are approx but pretty accurate at time of writing). We had to pick just one of the magnificent sites and that one was the 19th century Palace of Pena. 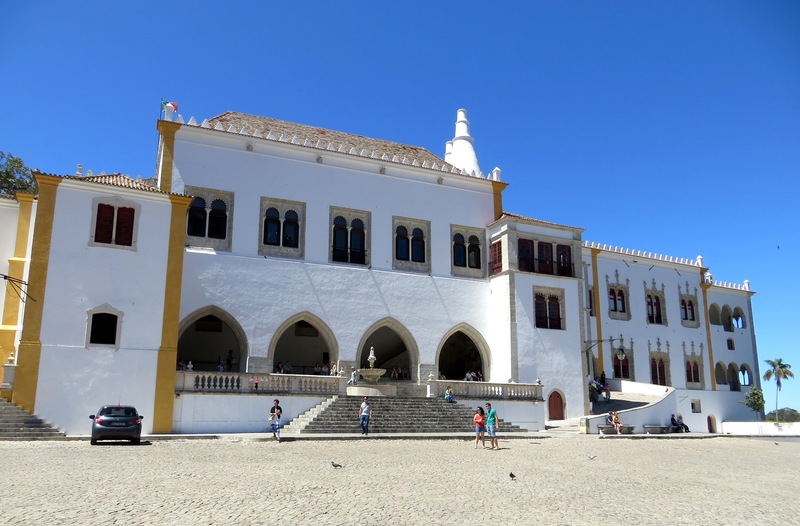 The 1st stop on the bus was the National Palace of Sintra, the cost to get in was 37Euros, we took a few photos of the outside and enjoyed the views into the hills. So we hopped back on the bus and headed a very short drive away to the Palace of Pena. 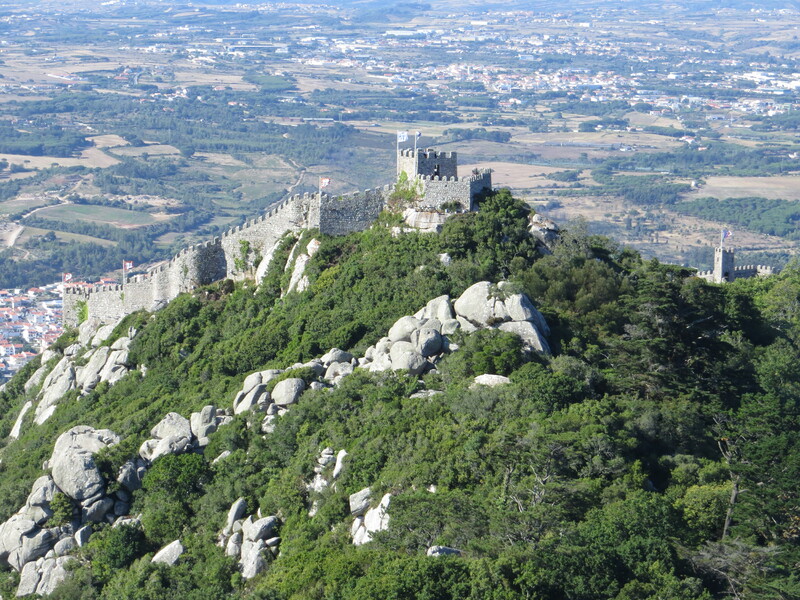 Moorish castle to Castle of Pena looked like a pretty easy and short walk especially if the next bus was to be some time away. I had admired photos of this very colourful palace for some time, it was in fact my main reason for wanting to come to Sintra. This castle is unique and every princesses dream, a little bit like something you would find in disney land, the colours of the walls more at home on a fantasy birthday cake than a castle, but once you accept the local style it really is beautiful, and very Romantic with an indian and arabian feel. Portugal love their external wall tiles and the castle had some impressive expanses. The views where incredible, especially when framed by arched openings in the terrace’s walls, the lack of glass in these ‘window frames’ and the perfectly clear day made the expansive views seem like a 3D special effect that contained more than the frame could possibly hold. We spent a few hours admiring this spectacular Palace and enjoying the views across the the pine forests that surround the Palace and shelter it’s grounds and over the foothills all the way to the distant ocean and even to Lisbon, as promised there was also a very good view to the moorish castle. Photo’s on the Castle’s flyers showed that a cloudy day here could be even more spectacular as the castle is often above the clouds, on those days this must surely be a scene straight out of a childhood fairytale. The temperature around the castle was lovely, it was much hotter down in Sintra and hotter still in Lisbon and Estoril that day, no doubt this was why royalty liked their mountain retreat, though had the mountain air not been cooler they would surely have made their way here for the views alone.